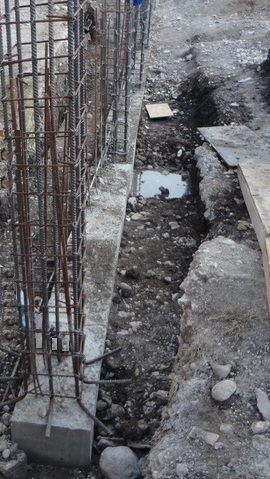 In this post we will discuss about continuous foundation as it is concerned with column spacing in a continuous foundation. In the very before post we have discussed about relative stiffness and its influence on foundations to be assumed as either rigid or flexible. The explanation of each parameter of the equations are described in previous post “How to Determine A Foundation Whether to be Designed as Flexible or Rigid Body?” and not described as post becomes very long. In this equation flexural stiffness of each member including columns and shear walls are considered to derive relative stiffness. The kr indicates the rigidity or flexibility assumptions and a table is provided in that post. In this post we will try to make relation between column spacing and rigidity consideration. a. In a continuous strip average load of two adjacent spans does not vary greater than 20% of greater value but less than the value 1.75/λ. b. In a continuous column spacing of two adjacent spans does not vary greater than 20% of greater value but less than the value 1.75/λ. Now we have no idea about λ. What is λ? ks =modulus of subgrade reaction in vertical direction.